Thanks for the schedule change! Hey! Why the downvotes ????????? I'm happy because we'll have another contest tomorrow and it's at a different time than usual. The other day I was complaining because contests are always 19:30 MST, so now I'm thanking for the schedule change. I assumed the time was as usual and couldn't compete. I guess I'm going to have to check each time now. Yes, how do they do this ! By practicing everyday and not wasting your life for something unimportant. Good luck all, hope a good rating for all. Finally a contest on a day off from work! There isn't a better way to enjoy my free time! Great ratings for all! +1. It's my timezone too. As well as 24% of the world's population. Here, recent Codeforces rounds typically start at 00:30 and end at 2:30 am. I find that in the middle of the night I can write code reasonably well, but seeing the solution to a problem is very hard, even for problems I find easy in the daytime. I'm not complaining, because I think it's exactly right that Codeforces should optimise contest timing for the western Russia community, as a first priority. 19:30 in Moscow seems good if it encourages having an early supper, which is healthy :) For some odd reason, however, TopCoder contests don't cater for Americans very well, because they also run most frequently in the middle of the night in my timezone. It might be because (a) there are some cultural differences, or (b) empirically this time maximises participation. please provide link to ur past problems if u have written any. Not a great time for some muslim coders that keep post. Contest is intersecting with iftar time:( In Tajikistan we can enjoy only one hour of contest. for me this time is just perfect, before three days because of the round #309 I had to delay my iftar time(eating time after fasting) by 1 hour and a half in order to participate in that round. Good for some, not good for others. This will always be the case. But at least it's different than usual, which means a chance to participate for coders who usually can't take part in contests due to intersection with work/school/etc..
With varied schedules, if you can't take a particular context, you may be able to take the next one. It's a good time to start the competition. sometime change is good I guess. I think it's better time than last contest because of Iranian Users can have better concentration for contest and have better performance. 21:00 in Iran or 19:30 in Russia is in Iran time for eating. thanks for time and person who changed the time of contest. good luck><! So any body know wich kind of problems andreysergunin usually gives (graph , math , dp ... ) ?? Usually he doesn't give problems cuz it's his first round, btw. Let's wish andreysergunin and Lord_F good luck! Thank you mister sherlock . Btw lewin prepared his first round last time but he was preapring problems in topcoder so peoples have previous idea about what he post . I hope there aren't math problems. All of computer engineer love math problem . it is not because i dont like math, i just like data structures, sqrt decomposition , graph theory more. Maths problems is sometimes interesting(brainstorm). But too many maths problems will make my brain feel tired. i think that the best programming contest are those wich involve lots of math ! I with Kronecker made math-only contest, but Zlobober unfortunately rejected it. Because most of people don't like maths problems, which seems boring in their eyes. During this contest, I am struggled with div1C. I tried to solve it with two segment trees... However, I have never played with segment trees for months... At last I failed... I think I should train my data structure skill. I wish I will have a better rating,Thank you very much. Do you guys use information from the scoring? This Time Is Better For Contests .. Even though there is nothing about score distribution in English version of the post, the Russian version of it says that the score distribution will be dynamic. When will the score distribution be announced? I believe it will be before the contest starts. I've got nothing against dynamic scoring, but damn those penalties on 250pt problem are harsh..
what are system tests ? 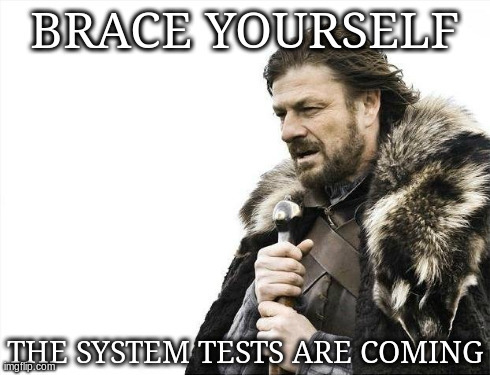 The test cases that your program executes on after the coding phase is over. But it was kinda obvious from the start because you can't put A into B if B is in something else in real life too. By the same argument, it was obvious that you can't take A out of B if B is in something else, but this was explicitly stated in BOLD LETTERS in the statement for some reason. Well, you're right. I didn't notice that. My personal sorry for that place. Using the bold letters here and hoping for a participant's common sence was a huge mistake that led to a such situation that even Russian-speaking contests were confused how the matryoshkas work. This is interesting! Aside from that, I know that you know what I meant by saying obvious. This is definitely not something that come to mind first (at least for me). If I know how Matryoshka works, it could be obvious. Unfortunately, I wasn't. In point of view of you, I can understand what you mean saying 'obvious'. For some reason, I thought it's like different size of cups or buckets, so I was really confused with the restriction. Now that I googled it, it's actually really obvious. When I was thinking about matryoshkas I didn't imagine closed ones, only bottom halves of them. If you're messing around with these toys in real life that way, you definitely can put A into B even if B is already in C, but it is kinda hard to pry out A from B if B is already in C. Pretty consistent with the first version of the problem, isn't? The Codeforces system is so fair! I tried submitting E at 01:59 and I got no response from the server! D: I submitted mine at 1:59:40, nearly broke my shoulder while running back to my laptop when I realized what a stupid mistake I made. Any suggestions on how to solve Div2 D / Div1 B? EDIT: I sorted the bridges in ascending order. I did the same with distance between each adjacent island, keeping track of the minimum and maximum length allowed. First store the max and min length required between each island . Sort according to min length . Start in reverse order that is take largest min length first . Find a suitable bridge using lower_bound . Ah, ok. I simply iterated from the beginning of both arrays. If the length of the current bridge was not in between the current min and max, then I moved on to the next available bridge. This looks like TLE, accorting to the 10^5 bounds. I apologize. I didn't finish elaborating. In my code, once I found a valid match, I would start looking for the next match considering only the bridges that came after the current one. However, this idea fails with the test case given by Bluespeck. My approach is somewhat different. I store all bridges in a set, because you can use a bridge only once, so with the set, you can easily erase the bridge from the set. I sorted all max (r_(i+1) — l_i) and min (l_(i + 1) — r_i) lengths by the maximum length. Then you try to fit the smallest bridge in the gap. If there is no bridge, or your lower_bound gives a bigger bridge, it's not possible. I wonder if this is correct. You will find a "suitable" bridge — I assume the shortest bridge that is greater or equal than current min. How can you know that you shouldn't take a greater because it is too large to cover other islands? Div 2 problem B description was a bit confusing. I was under the impression that a gear can move both clockwise and anticlockwise and that we had a choice. Therefore I was trying a DFS kind of approach will would obviously time out. Later I figured out that a gear can only move in one direction. I have a question. IF the problem is worth 250 points and you make 5 wrong submissions of it, at the end of the round, will you get negative score or still 30% of that problem's value (or whatever the minimum point value for the problem is)? Thanks. Howevr I think that wrong submission penalty should be dynamic. Especially with a dynamic scoring. I thought very hard but couldn't find a way to solve div 2 D . How to solve it? What's wrong with the Div2. D greedy solution? Sorting bridges and sorting island pairs (with their maximum value and minimum possible value) + binary search (some kind of lower_bound in bridges). I had something similar, but there will be cases where this fails. It's like you sort the islands pairs looking at minimum possible bridge and then at maximum possible bridge it fits. Then, for each pair you search in the sorted bridges array for the shortest possible bridge. Greedy solution is the right one, something is wrong with your "greediness". Not sure... I took a greedy solution too and got stuck on pretest 10. Well, the thing is that you put the next bridge in the interval that isn't already used and ends first. Could you explain your solution? I checked your profile and it says you didn't submit for that question. bridges must not intersect right ?? Yes 2 1, if I sort islands in ascending order and in other case I get a "No"
what is the answer for this case ?? Yes.But in the code given by CrazzyBeer I get a "No"
Here is my approach , for each GAP , find the min and max value it can take. Let it be ai and bi. Now sort the GAPS with respect to the DIFFERENCE (bi-ai) , so lowest difference gets first. Now , sort the bridges too with smallest first. Now , iterate over the GAPS , try to match it with the smallest bridge. I also got stuck on test 10. Consider two gaps, [1,3] (i.e. 3 is max, 1 is min value it can take) and [3,4]. You have two bridges of length 3 and 4. The greedy sol'n above results in using the smaller bridge of length 3 for the second gap, and leaves no bridge left for the first gap, when you could have satisfied both gaps. The difference in ai and bi is not a good metric; having smaller range of values doesn't imply it should be satisfied first. The statement for Div1.A/Div2.C can be more clear. I think submission penalties for Div1 A should be cancelled for people who got WA on pretest 6 prior to the clarification. not only submission penalties , extra time penalty because of resubmit should be removed too. What is pretest 6 on Div1 A/ Div2 C? I did not see the clarification because I started at min 40. I've read Div1.A task. Thought that its too easy for Div1. Read again. And again — trying to find something tricky. Spent 10 mins, surrender on that. Coded this simple solution for simple task and it passed pretests o_O. For me today was the day for WA on pretest 6 (8 WA on 6th pretest ) . Any tricky case for div1 B ? Wait, wait, wait for me guys! ...and I like blue color more than purple anyway. The contest was great !!! Problem B div 2 is O(n^2) ????? Just check for index 0 that how many steps counter clockwise you need to rotate to make its value 0. perform those number of steps in every other array index and check at last if it matches then "Yes" else "No". Complexity O(n). You check if it's strictly ordered (like 0,1,2,3,4,5..n-1). If not — iterate through the array and do all the changes. I have done that exactly 2000 times. My solution also run approximately O(N). At first I calculate how many time I need to push the button, then I cheek for all i (in range). problem D of div2 is hard fo me. Can somebody please explain why this solution gets TLE, it's linear — http://codeforces.com/contest/555/submission/11791988. I tried scanf/printf and I wrote it in C too but the outcome was the same. Then I deleted everything and wrote it again and it passed but why it didn't pass at the beginning? How did this pass 14 pretests? WTH I registered for the contest 24 hours ago !! Why cant I submit any solution ? Div2A: Time limit exceeded on pretest 12 Wasn't expecting time limit errors on A task... anyone else hit by that? It will be the same as if the task have static 250, no? If so, nothing changed. It kind of discourages hacking and not much value for speed is given either. Difference of +100 initally due to early submission time is now like +10 or +20. But 2 faults in hacking gives -100 difference direct. Imo, its pretty fair. You should hack only if sure it succeed. Hacking is my mistake, okay. But still, if 2 hacks make my score less than someone whose submission time is ages(people who submitted near end have higher points) after me, I feel there is an imbalance somewhere. Well you know, its balanced with task complexity — if you try to hack on e.g. task E it won't be the same. After this round, I think learning Russian is more important than English . Which problem makes you think this way? problem statement . what exactly do we have to do. I am having really hard time with words like contained and nested . just imagine the dolls and how can you remove one, or put a doll inside another. first, you need a minimum of k-1 seconds to reassemble the chain from initial configuration. then this chain is consistent and there is no need to reassemble it. other wise you will need to disassemble all elements from the point of inconsistency. Can 2 chains be attached together ? suppose 1->2 and other 3->4 can these 2 be combined in a single step? Good time! Wish more contests like this. how can adj[u] changes to adj2[u] if copy paste? Yeah, I copy pasted two dfses, but I only changed one instead of both lists after I copy pasted. I was afraid I was going to run out of time if I didn't copy paste, but looks like I should've taken the extra 5 seconds to check it over. I ended up debugging my B during the contest. Found bug after the contest. Please gcd let not my integers overflow today. You have to normalize the coordonates on C div1 because QlogQ gets AC but QlogN doesn't, very very smart. I've got AC with O(Qlog2Q) in upsolving. So I think O(QlogN) can pass. The contest ended 1.5 hour ago. He solved all the problems 0.5 hour before the end. He visited 3 hours ago. Am I the only one confused?? "Last visit" doesn't mean he has beel left this site 3 hours ago, this is mean he last time entered site 3 hours ago. He just solved all problems and left. probably it's the time when the person last logged in. Nein, no one named 'wrong' here. Sometimes it shows time from moment when you entered site, not when you left it; sometimes if you entered for a short period of time only — it does not update at all. Sometimes value randomly updates to older — you see "3 hours ago" there, press f5 and it becomes "9 hours ago". Personally I like the last one. The next weekend will be earlier, right? Trying to solve div1B using TreeSet I found out that I can't use the structure if there are duplicate keys. Here you can find why. "For example, if one adds two keys a and b such that (!a.equals(b) && a.compareTo(b) == 0) to a sorted set that does not use an explicit comparator, the second add operation returns false (and the size of the sorted set does not increase) because a and b are equivalent from the sorted set's perspective". How to solve the problem then? Well, one could use TreeMap<Long, LinkedSet> instead. If the input would have been sorted in Div. 1 D I would have 100% solved for the first time. With unsorted input I was late for 2 minutes. I really wonder what 'technical reasons' are in Codeforces Round #307 (Div. 2), Codeforces Round #307 (Div. 2), Codeforces Round #305 (Div. 1), and others. P.S. I changed my avatar to red. One should always have a target. Hope I become red, as my avatar this year. the same here in test case 2 !!! Try clearing some array that you have initialized. I am not getting that why linux machine result(having the same gcc compiler) differs from codeforces compiler result? From Stack Overflow- " There is no automatic initialization in C++. Your new bool will be "initialized" to whatever was in memory at that moment, which is more likely to be true (since any non-zero value is true), but there is no guarantee either way. You might get lucky and use a compiler that plays nice with you and will always assign a false value to a new bool, but that would be compiler dependent and not based on any language standard. You should always initialize your variables." What a luck..!! That all of my n sized boolean array took 0 value(false value) by default even though I didn't initialized it and I wasted around 45 minutes + 2 Wrong submissions.. It turns out this code gives different results for GCC and MinGW. :( Shouldn't have coded that in the first place, but I was sleepy so I didn't notice it. Can somebody tell me why my code for Div1B http://codeforces.com/contest/555/submission/11803847 TLEs ? Know your libraries. std::lower_bound is O(n) for a set, not O(log n). You probably wanted b.lower_bound() instead. Thanks, Now it's accepted, I definitely have to take note of this! lower_bound(set.begin(), set.end(), x) works in O(N). The Tutorial link in problems of this round opens Codeforces Round 309's Editorial.Is Round 310's Editorial published? Nope, it's not published yet. When The editorial of round 310 will be available ? Can anybody help me with the logic of Div 2 problem D? Plz elaborate in detail. I don't think the editorial is coming up any time soon, so here goes. Given that we have to connect two islands with co-ordinates (a,b) (c,d) with some bridge of length l such that l<=(d-a) and l>=(c-b), since all islands lie on a straight line. Now we are going to implement a greedy solution, ie we sort all islands by their smaller distance(c-b) and try to assign the smallest bridge possible to the bridge. This solution will however fail in cases where although the smaller distance between the islands (c-b) is the minimum among all islands, but the larger distance is greater than the rest of the islands. You can think of it in terms of flexibility of an island defined as the range of accepting lengths of bridges from [c-b,d-a]. Our initial greedy algorithm will assign bridge of length 3 to connect I1 and I2 and then would be unable to connect I2 and I3, but clearly switching the bridges gives us a solution. Therefore, we sort all islands by their larger distance(d-a) and then try to assign a bridge to it that is as close as possible to (c-b), ie we give highest priority to island with lowest flexibility and try to assign a bridge to it that just connects the island. Can anybody help me with my runtime error for Div.2 D at test case 11 (11810093). Every test case passed until the big one with 100000 islands and bridges. looks like the editorial is going to take forever !! please any body, what is wrong with my approach for problem Div2 D. wtf!! debug your code yourself. in general,my friend and I have a very tired contest......As I said -> DeaphetS he is the most hansome boy in our school . Can someone please explain me why my all 3 submitted solutions were skipped in yesterday's contest 11804905 ,11800557 and 11788258 ? Solutions usually get skipped when they are found to be similar to someone's code. Did you ideone? I didn't find the tutorial for this contest, somebody give me the link . this link redirects to editorials of the previous round (309). *edit* now the link works perfectly fine .thanks a lot. Div 1D is very intuitive and easy! Comparatively div2D was tricky imo. that's what I thought, but after looking at someone's accepted code, it was the same as my logic. complexity= n*logn*logl in worst case. Finaly solve problem Div.2 D (11818401): Let represent an island as pair ii = (li, ri). You have to sort all island pairs (ii, ii + 1) after their maximum distance in ascending order. The bridges can be save in a set. Than we start at the beginning of the sorted island pairs and perform for the minimum distance dmini = li + 1 - ri the operation lower_bound(dmini) on the set. We have to check if the resulting bridge fulfill the requirements and erase the bridge from set otherwise print "No" and exit. We repeat the procedure for each island pair. Note that we have to put a little work on the datastructure since the output requires the indicies of the bridges. Official editorial is almost ready. Take input of all the co-ordinates of the islands. Simultaneously, store the gaps in the form of an object which takes in co-ords of adjacent islands(Li,Ri,Li+1,Ri+1) and stores [Li + 1 - Ri;Ri + 1 - Li]. All of these gaps are sorted in ascending order on the basis of the above formula. If value of any gap is the same, then there is an extra unique key, 'diff', which separates them. This condition has been met in the Comparator in the TreeSet which sorts the keys, as mentioned in ascending order. Take input of all the lengths of the bridges and store them in a HashMap which stores the length of the bridge as the key and maintains a TreeSet for each key which stores the indices at which this bridge length has been found at. Now finally, Iterate through all the gaps stored in the TreeSet and obtain [Li + 1 - Ri] and [Ri + 1 - Li] which has already been stored in the custom datatype. Iterate through this closed interval in ascending order and keep checking if the Map contains any value in this interval. The first value it finds, assign this index to the gap which is stored in an array. 0th entry stores the index for the gap 1 between bridges 1 and 2 etc. If no value exists in any interval, break and print No. Else, print Yes and print the indices stored in the array for each gap. Can anyone explain Haghani's solution of problem DIV 2E/1C ? Its so simple and elegant but i don't get how it works. This Problem and Case of Matryoshkas (Div2) are exactly same problems. I'm sorry for necroposting and pedantry, but the first picture in the note for problem D (Div. 1) isn't consistent with the sample test -- the coordinates there are 0, 5, 8, while in the sample test they are 0, 3, 5. It confused me (while upsolving), and can confuse someone else. Supposing that the picture was made in MetaPost, it's a matter of several minutes for the authors to correct this. Yeah, thank you for reminding of that. Actually, only coordinates are wrong while the overall illustration is kinda correct. But you're right and it should've been corrected. Your supposition is wrong and it might take some time to fix it. Server time: Apr/19/2019 02:16:44 (d1).